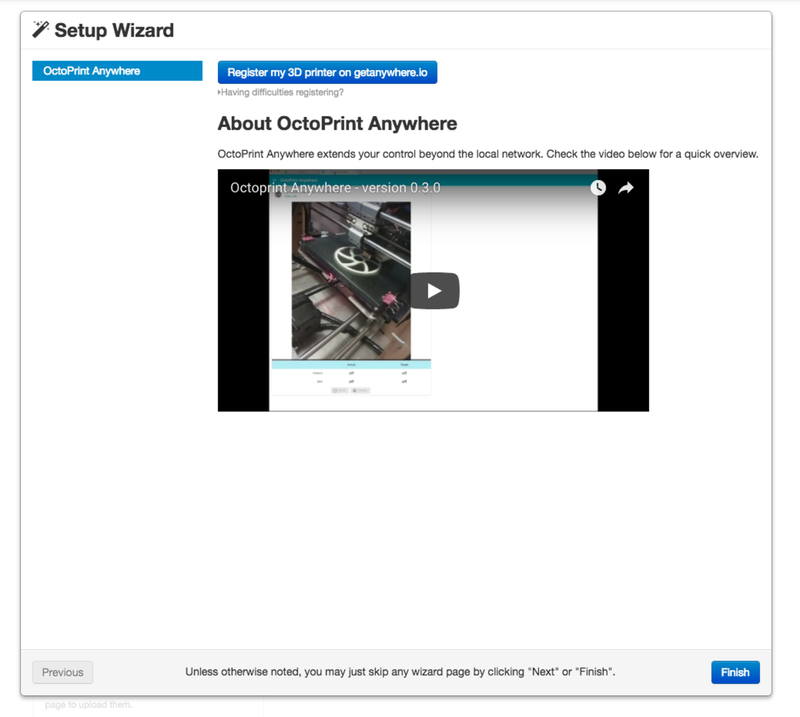 This guide will show you how to access OctoPrint over the Internet (from anywhere) using the OctoPrint Anywhere plugin, allowing you to monitor your prints from your phone or other remote device. OctoPrint itself is [intentionally] limited to connections over your local network. But what happens if you want to monitor your print from work, the bus, or the coffee shop? This is where OctoPrint Anywhere steps in. It allows you to securely control the core features of OctoPrint over the Internet without needing to mess with port forwarding on your router. OctoPrint Anywhere is free to use for your first printer, plus $5 per month for each additional printer. Safety meeting: You should never leave your 3D printer unattended, no matter which printer you have. 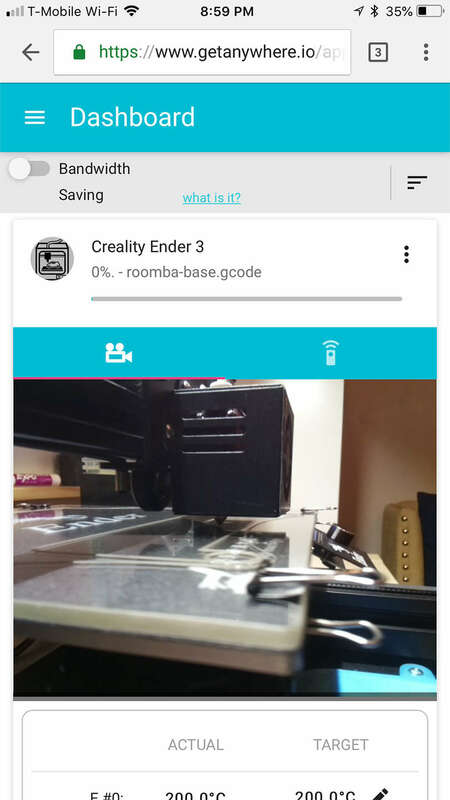 This guide is meant to let you monitor your 3D printer remotely, but you should ensure a spouse, coworker, roommate or friend is near your printer while printing in the case of an emergency. 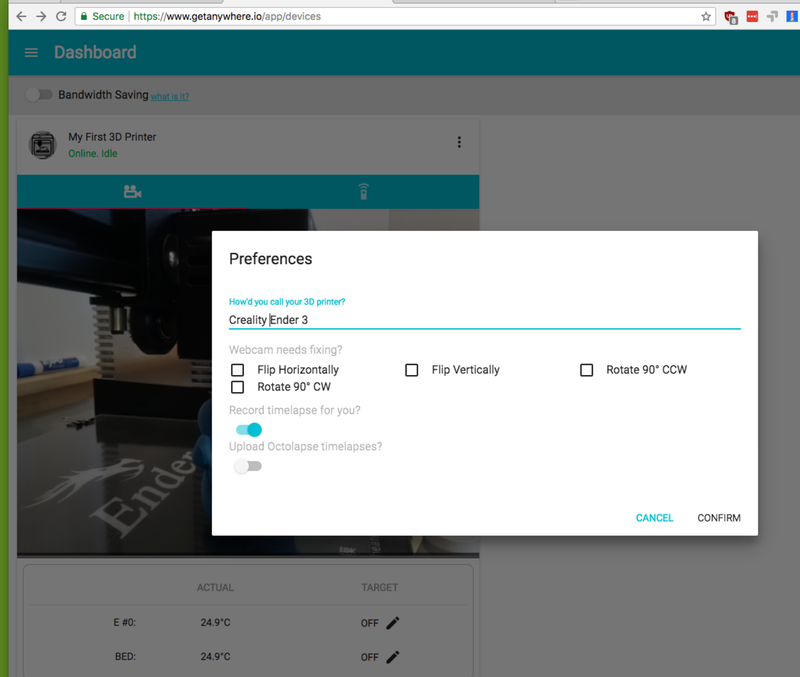 With OctoPrint Anywhere, you'll be able to monitor your printer's live video feed, control your bed and extruder temperatures, pause and cancel prints, control your stepper motors, and more. I have not considered remote job starting as a feature on the roadmap because I think, more often than not, a user will have to do some work (taking previous print off the plate, leveling the bed, making sure the filament is what you want, etc) on the printer before kicking off the job. I suppose this makes sense. After all, your print surface isn't normally prepped while you're away. Still, I look forward to this feature being added in the future and the existing print control features are still more than worth it. 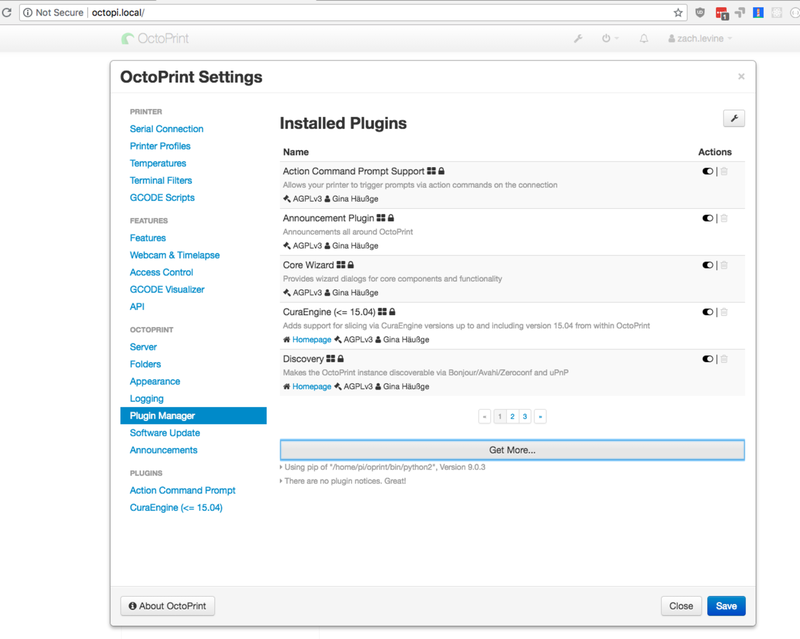 Of course, be sure to install OctoPrint first before performing this guide. Obviously, make sure no prints are running during this process as you will need to restart OctoPrint. Click the settings icon in the top-right and then select "Plugin Manager". Then, click "Get More..."
Type "octoprint anywhere" into the search box and click "Install". It may take several minutes to download and install. When it finishes, click the "Restart now" button. 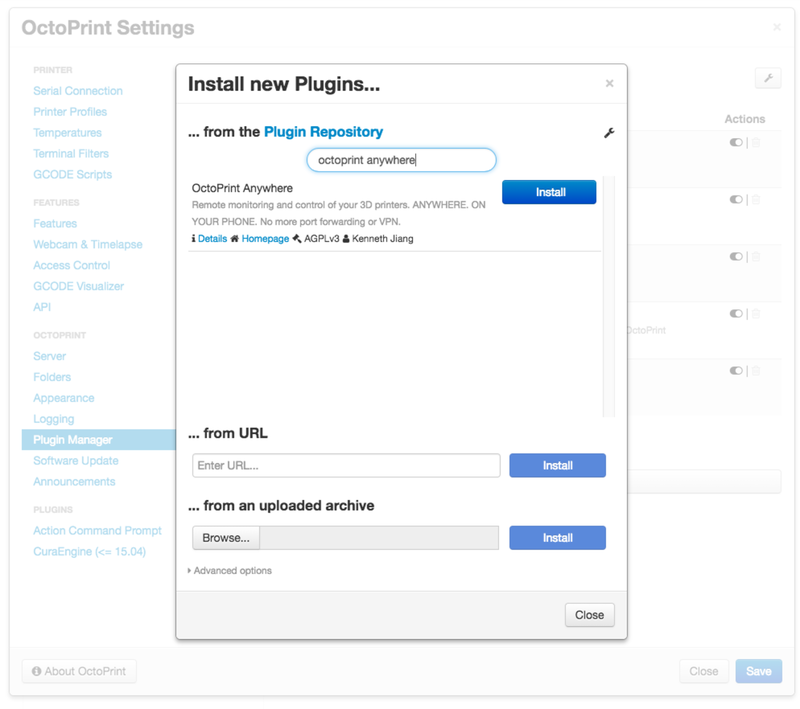 You'll need to create a free account and register your printer with OctoPrint Anywhere. 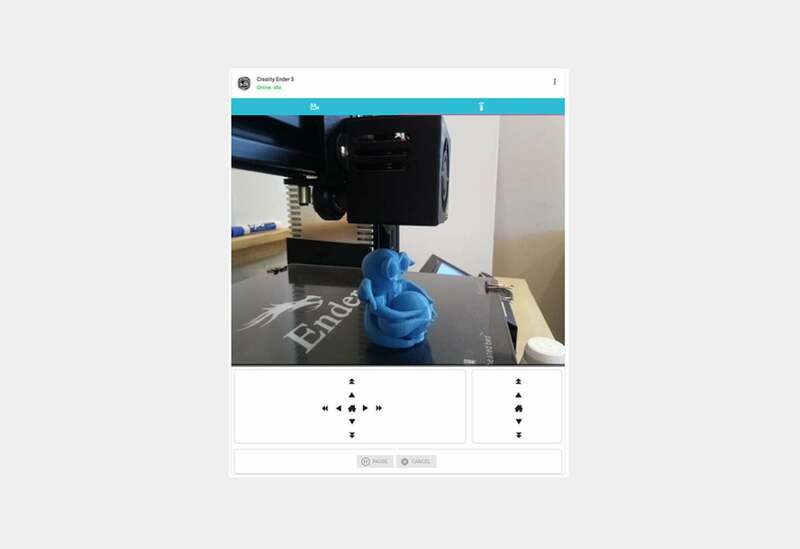 To do this, click "Register my 3D printer on getanywhere.io". After registering and creating your account, you will immediately see your printer feed. IT'S BLACK MAGIC, I SAY! Click the triple dots and then "Preferences" and change the printer name from "My First 3D Printer" to whatever you'd like. This option reduces the amount of data that's sent to your phone while viewing the interface. This option reduces the bandwidth streamed to the device you're viewing OctoPrint Anywhere from. I recommend turning this on if you're accessing from a mobile device and have limited bandwidth, but this will reduce streaming quality. 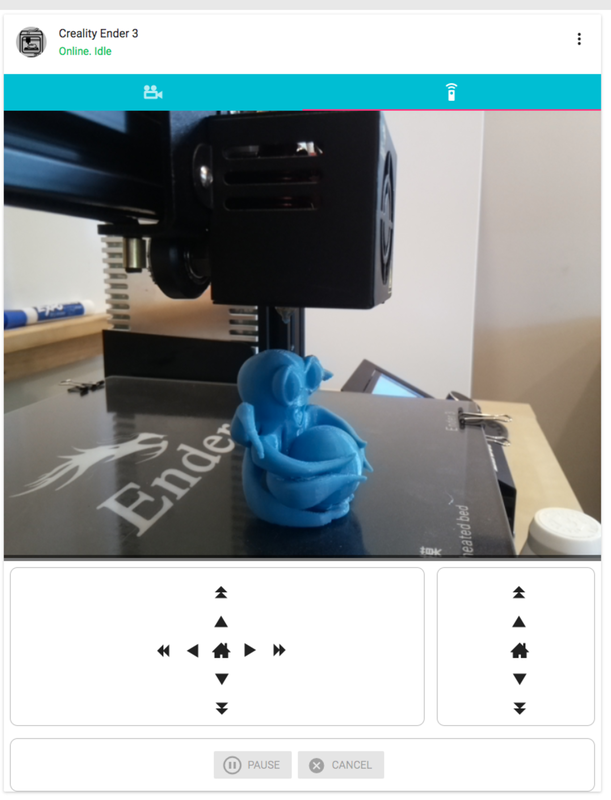 You can now log into OctoPrint Anywhere from your phone by visiting https://www.getanywhere.io/. If you run into any issues, post in the comments section below and I'll do my best to help you out. Or, check out the Issues section of the official OctoPrint Anywhere Github repository.